The BMW X5, pictured, has been put to the test in the Mongolian desert. SHANGHAI -- BMW has narrowed its market-share gap in China with Audi since starting driving courses in 2006 to attract new buyers and build brand appeal. Rising numbers of wealthy Chinese are boosting sales even as overall vehicle deliveries slow this year after the government imposed purchase restrictions to curb congestion. BMW's share of the country's high-end sedan segment has risen to 24 percent this year from 21 percent in 2006, while Audi's has declined to 28 percent from 50 percent, according to Munich-based Roland Berger Strategy Consultants. Test drives and cross-country expeditions showcase new technology and expand customer interest, said Lu Yi, head of sales and marketing at BMW's China import unit, in a July 19 interview in Ordos. The programs also help take motorists like Tom Liang, who lives in Beijing, outside their mostly urban driving environments. Biejing is tied with Mexico City as having the world's worst commute in an International Business Machines Corp. survey last year. For two days in Inner Mongolia, Liang took a BMW X5 SUV up 100-meter sand dunes and across rocky river beds past camel cemeteries. "Driving in the desert brings out all the best functions of the car," said Liang, 36, who attended BMW's first off-road terrain course held this month in Ordos, northern China. 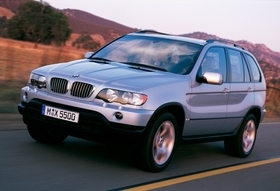 "This training opened my eyes to what my X5 can do." Lu said: "People want to have technology, they want to have service, and they want to have a car ready to express themselves. You have to find unique new ideas." BMW started its first China driving course in 2006 on the Formula One race track in Shanghai, and a year later held winter rally racing in northeastern Jilin province, where temperatures in January plunge to an average minus 12 degrees (-24 Celsius). The world's largest luxury carmaker also began organizing self-drive expeditions on the mainland in 2006, called Destination X. Past tours have included routes along the ancient Silk Road in northwestern Xinjiang region. A group of 96 BMW drivers will start this year's Destination X from the Russian-Chinese border city of Manzhouli in Inner Mongolia to Harbin in northeastern Heilongjiang province, a journey of 900 miles (1,450 km). In Ordos, home to a mausoleum for 13th-century Mongol conqueror Genghis Khan, drivers pay 20,000 yuan ($3,100) for the two-day BMW off-road driving course. They learn to decrease the tire pressure to gain more traction, to continue climbing and accelerate up a slope no matter how bumpy the terrain, and to dig out the front and back wheels when stuck in sand. BMW will increase its China sales by 48 percent this year, outpacing Audi's projected 18 percent growth, and 44 percent for Daimler AG's Mercedes-Benz, according to estimates by Westlake Village, California-based J.D. Power & Associates. Total vehicle deliveries will grow about 5 percent this year after surging 32 percent to a record in 2010, according to the China Association of Automobile Manufacturers. Luxury-car sales in the world's largest auto market will expand about 30 percent this year, J.D. Power estimates. BMW CEO Norbert Reithofer raised his global sales forecast July 12 on buoyant demand from international markets. The automaker now anticipates sales of more than 1.6 million vehicles this year, up from a previous forecast of deliveries in excess of 1.5 million units. Audi, whose A6L sedan was the best-selling luxury car in China last year, has followed suit in introducing more driving programs. The carmaker offered snow and ice-training courses in 2010 and held an eight-day desert trip in northwestern Gansu province, its first-ever self-drive tour in China for owners. Mercedes started its AMG Driving Academy in the country last November with race-track courses. BMW's X5, which starts at 896,000 yuan ($139,000) in China, competes with Audi's Q5 and Mercedes' M-Class in the high-end SUV segment. Audi, whose early entry into China and popularity in government service gave it the biggest share on the mainland, saw first-half sales grow 28 percent, delivering 140,699 cars. Mercedes sold 95,030 units, an increase of 59 percent. BMW's first-half sales in China rose 61 percent to 121,614 units. BMW has gained market share rapidly while being a late entrant to the Chinese market, said Ashvin Chotai, managing director of Intelligence Automotive Asia, which provides research on the industry. "The brand enjoys a more favorable image among private buyers, especially younger affluent buyers," said Chotai, who is based in London. More than two thirds of the luxury car buyers in China are under 45, compared with about 50 percent in the U.S., he said. The carmaker topped a poll for the most desired brand in China, beating out 150 consumer names such as Apple Inc. and Cartier, according to an online survey by Hong Kong-based Clear Asia, which advises companies on branding. Mercedes was eighth on the list, while Audi came in 12th. "Respondents say BMW is more modern, confident and ambitious than the other auto brands in the study," said Oliver Cartwright, regional managing director at Clear Asia, whose firm surveyed 2,800 Chinese at the end of 2010. The respondents had an average age of 31 with a mean annual household income of about 80,000 yuan. For Liang, the Ordos training has deepened his brand loyalty. He switched from an Audi A4 to a BMW 325I in 2008 after trying out for a Destination X tour. "After I go for these events, I get more and more interested in BMW cars," said Liang. "Whatever car I need, I will always think of BMW first."